Max was born and raised in Yurburg, Lithuania. He was a Zionist and upon graduating high school, he was prepared to emigrate to Palestine, but upon consultation with the local Zionist group, he was told that he must have a profession to be helpful there. He was told that they were building a new country and a civil engineering degree would be very valuable. He left Yurburg in 1921 and went to earn an engineering degree in Germany. He had been sent an entry permit by an uncle in the United States. Upon graduation in 1925 he made alyiah to Palestine instead immigrating to the United States. He sent the entry permit to his brother, who came to US and settle in Detriot. Max settled initially in Jerusalem and worked in an architecture office there. In his early years there, he designed some of the first new housing in Jerusalem outside the old city, in Neve Yakov. This neighborhood was destroyed by the British and the land became part of Jordanian Jerusalem in 1948. Today there is an Israeli army camp built on the spot. In the 1930's Max designed at least two apartment buildings in Tel Aviv in the modern "Bauhaus" school of architecture style that still exist. He married and raised two sons. 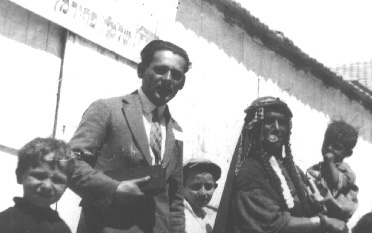 Max eventually became the Chief Surveyor in Israel. His cousin Ezra Kapshud, also a civil engineer, who was born and raised in Israel, said that Max is considered the "Father of the profession of land appraisal in Israel."